Functionality | EuroRisk Systems Ltd.
RFW supports - in one or several model sessions - lists of basic objects, such as customers, portfolios, instruments, scenarios, real estate, nomenclatures, settings and market data. Model sessions contain primary information for the definition of the system's functionality and competence. This is ensured in a highly flexible manner by the GUI description, the business logic rules and the database structure. Selected modules, along with their models, create sub-applications in desired areas. 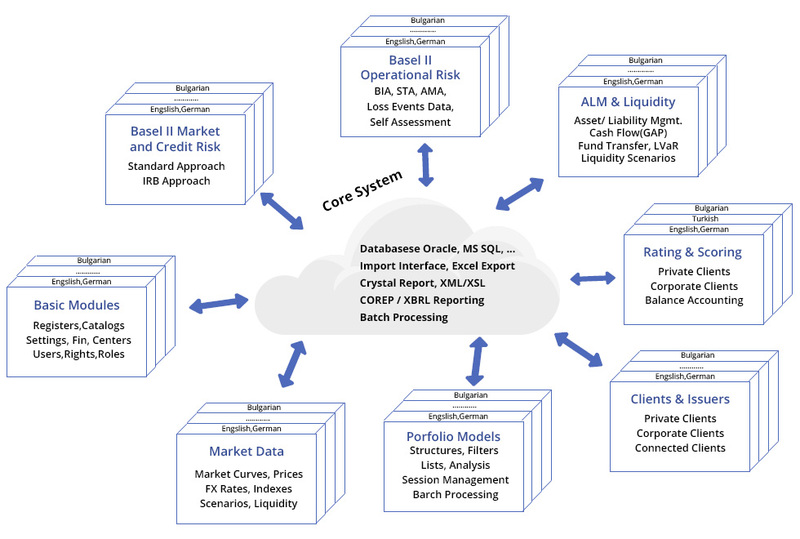 For example, models for credit risk, rating, collateral management and COREP-reporting support the Basel III credit risk sub-application. RFW is highly extendable, enabling the adding or extending of models. In this way, it ensures a rapid development and adaptation of user requirements in an unlimited number of application areas and their combinations. RFW accesses data using independent layers to database management systems, connectors and imports / exports, enabling an easy integration into existing systems. For more information on RFW modules and their functionalities see the table below. Settings, currencies, countries, cities, markets, financial calendar. Interest income analysis including FTP. Clustering, correlation matrix and volatility, market factor distribution. Self assessment questionnaires about Basel III categories. Capital requirements (market, default, life underwriting risk). Quality assessment collateral, credit application rating. Management of notification events: messages, SMS, e-mails. The usage of models provides the means for an easy and flexible customisation (change) or functionality enhancement of the system by modifying or adding new model scripts. RFW establishes a platform for development of software applications based on a modern paradigm of object-oriented programming, artificial intelligence, neural networks, statistics and simulation.